This Whitepaper will provide an overview on personalizing customer experiences to pinpointing undetected fraud, and how to identify business efficiencies. Financial Institutions are under increasing regulatory and compliance scrutiny, competing in a growing atmosphere of disruptive technology and customer churn, and searching for ways to drive efficiencies in their business operations. 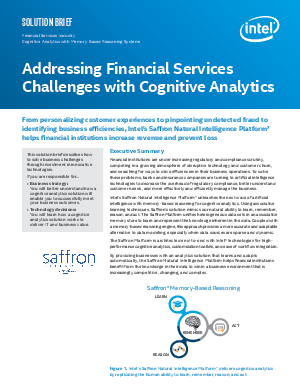 Intel's Saffron Natural Intelligence Platform helps financial institutions increase revenue and prevent loss.